Preheat oven to 350 degrees. In a large microwave safe dish melt butter and butterscotch chips, 1-2 minutes, stirring every 30 seconds. Whisk until smooth. Add sugar, eggs, and vanilla. Whisk again until well-blended. Stir in flour and salt. Add chopped candy bars and combine. Pour into a greased 9 inch cake or tart pan. Bake for 30-40 minutes or until golden brown on top and a toothpick comes out with just a few crumbs. 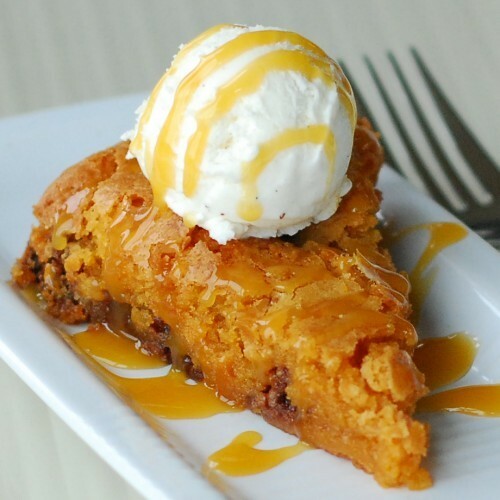 Marvelous topped with ice cream and butterscotch sauce! !